Lately, contemporary fashion has been on my mind. Not any contemporary fashion, or the “vintage inspired” look that is seen everywhere. No, I am talking about Spanish contemporary fashion. Ever since my darling and I visited the beautiful town of Tarragona back in the beginning of the month, I have been having a crush on Spanish fashion. 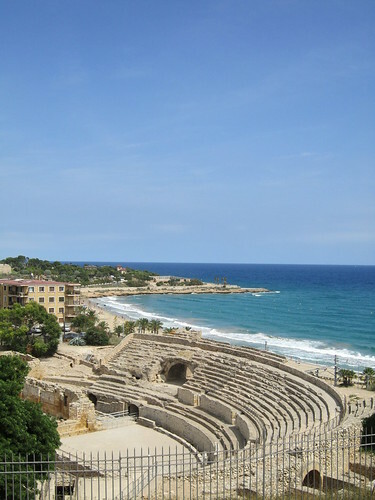 Photo from Tarragona, taken by my darling. It seems to me, and this is purely based on my own personal observations in one Spanish (or should I say Catalan) town, that the Spanish women know a thing or two about style, that I could learn from. Anyway, all of this has lead to me pulling out all of my Patrones magazines, and this resulted in the making of a simple, black corduroy skirt, with just one asymmetrical pleat. I am also planning to make some cool corduroy pants, and some flowy tunics. The pattern is from Patrones Costura Fácil no 3. And the pattern number is 57. I shortened the pattern pieces by 15 cm to get the look I wanted. That´s all for now, see you in September! Nice skirt! I love Patrones but is not available in Toronto, where I live, so I always try and pick it up a few back issues when I visit South America where my family lives. And yes, I agree that those Spanish ladies have great style – simple and elegant all at the same time. Very cute skirt! 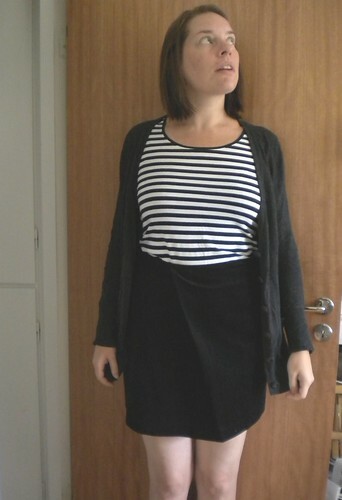 It would be great with block-striped tights on a cold day!